If nursing is your professional goal, there is no better place to begin your career than in Army ROTC. Army ROTC offers you a unique opportunity to gain practical experience while you receive financial assistance for college. You have chosen a demanding profession. Medical emergencies require a cool head and clear thinking. Making the most of your skills, building a sense of confidence, and helping you realize your leadership and management potential are what Army ROTC is all about. As an ROTC nursing student, you will be able to combine college electives in military science and invaluable nurse summer training experience with your regular nursing program. You will develop your professional skills while you learn meaningful things about yourself and what you can accomplish. Upon completion of the program (and provided all prerequisites are met), you will receive a commission as an officer in the Army Nurse Corps, ready to take on the challenges of your profession. You will find that your Army ROTC experience has taken you a long way toward realizing your professional goals. Experience – You will not find anywhere else the kind of direct, hands-on experience you will receive in ROTC training. You will be given significant responsibilities early in your career. Leadership – An officer is a leader. That’s why leadership and management are stressed as part of the ROTC nursing program. The Army provides nursing students with unique training to develop the skills that will help you take command. Advancement – There is no mystery about how to get ahead in the Army Nurse Corps. Promotions are based on performance, and the career path is clear-cut. You will be given the opportunity to progress in rank as your nursing proficiency and effective leadership traits are demonstrated. 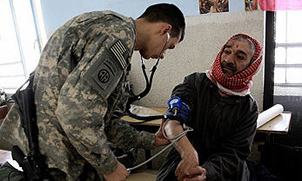 Professional Environment – As an Army Nurse, you are an important member of the health care team. You’ve been given the training to meet problems head-on and solve them quickly, adapting to the situation and taking charge. You are a thinker and decision maker, earning the respect of your colleagues and the people who work for you. If you are interested in this program or any other ROTC program, contact the Recruiting Operations Officer at 731-881-7682/7150. Interested in what the ROTC program has for people getting their Masters in Nursing fields? Click here for more information.